Looking for the best bike basket? When buying a bicycle, we mostly pay attention to the frame, the wheel, spokes, fork, brakes, tires and tubes. Not many of us pay attention to the carrier or the simple bike basket. However there is no denying the fact that the baskets play an important role. It helps us to lug around small purchases and for other such purposes. Since we do not pay much attention to baskets we often end up buying the wrong one. So, we will try and have a look at the various things to be kept in mind when it comes to buying the best bike basket. This is a quality bike basket coming from the house of Colorbasket. They have been into the business of bike baskets for many years now and therefore this specific model also has quite a few interesting things about it. It would be interesting to therefore have a closer look at the various features of this small bike basket. It comes with unique and attractive design, the patent for which is pending. It is made from quality steel which is powder coated. Hence it is rust and corrosion proof. It also is long lasting and therefore offers the best value for money. It comes with a well designed mesh bottom design. This is perfectly suitable for small items. It also has a padded attachment. This protects the bicycle from damage. It comes with a size of 13.5 inches length, 9.8 inches width and 9.5 inches height. It is perfectly sized to carry small things around without too much of an effort. It is conveniently designed and can easily be mounted in the back or front as the users want it. It comes in attractive colors ranging from white, purple, black, green, and pink. It requires very little maintenance and is sturdy to withstand the vagaries of the weather. It is reasonably priced and mounting it takes just a few minutes. In fine it certainly offers good value for money. However, there have been a few instances where the basket has rattled. This has more to do with the fixing and mounting than anything else. When one takes into account the various attributes such as material, color, design and size, it is quite obvious that this is a high quality bike basket that has been built to perform and offer the best possible utility to the user. This is a quality product from Retrospec and there are reasons to believe that it is a candidate for being the Best bike basket in more ways than one. It is extremely ethnic in its looks and comes with quite a few common sense features which make it very convenient and easy to use. Here are a few important features as far as this basket is concerned. They are made from durable cane which helps them to remain strong for many years at length. 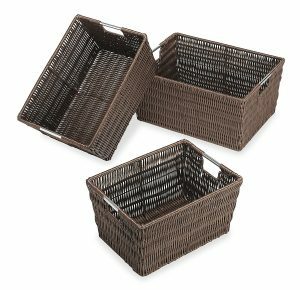 These tout baskets are rectangular in shape and they look naturally beautiful. The design and weaving ideas have been influenced by the time tested and proven Nantucket Lightship Basket. They also come with adjustable leather straps which also have brass buckles. This makes it possible to have the basket easily attached to the front handlebars. They are capable of handling a maximum weight of 15 pound and come with a dimension of 9 inches x 10 inches x 14 inches. They come with easy to install buckles and belts. Hence no tools like screws, nuts and bolts are required which often is the case with many bicycle baskets. It has a wide symmetric opening which makes it easy to carry shopping bags, school notebooks and other such small things. It is quite sturdy can withstand daily wear and tear. The only drawback is that it can accommodate only around 15 pounds of things and this in fact is the maximum which most bicycle baskets can accommodate. 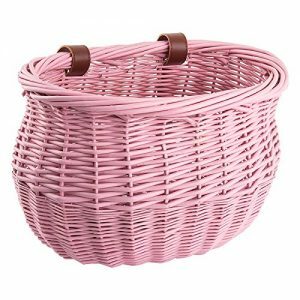 After taking into account the various pros and cons, it is quite obvious that it is a conventional and classic looking basket which is perfectly suitable for modern day needs. There is no doubt that children in particular will have a great liking for these baskets. If you are looking for a quality bike basket which is rust proof and also good looking at the same time, it makes sense for you to have a closer look at this basket. It is from the house of Ohuhu and therefore has a good reputation to rest on. Additionally it also boasts of a number of interesting features which are worth looking at. It is weather proof, rust proof and long lasting. This is because of the quality plastic coated steel construction. Further it is known for it easy and simple installation. All that you need is to fix the handlebar hooks along with the Velcro strap. Installation and uninstalling should not take more than a few minutes. It also has a unique foam coated rest along with hooks. They go a long in protecting the handlebar and head tube from getting damaged or scratching. 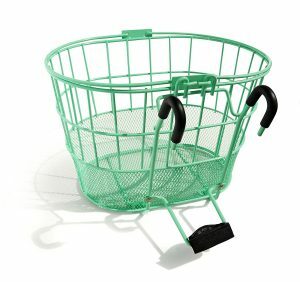 Another unique feature is the removal handles which can make helps to lift the basket of and carry it around for shopping. Perfectly suited for light shopping because of the unique feature of ability to lift the basket off the bicycle. It also has a special mesh bottom design which helps to keep loose and small objects and prevents it from falling off. Ergonomically designed, this best bicycle basket looks extremely good and is bound to catch the attention of passersby. It has a total dimension of 14.6 x 11.8 x 11.4 inches making it extremely comfortable for reasonably big purchases. It also can hold around 20 to 25 pounds of weight. The hooks according to a few customers are not properly designed and there are instances where the basket pops off the bike. There is no doubt that this a quality bike basket made from high quality material. It has been designed to last and therefore it will offer the best value for money to its customers at all points of time. It has many positive customer reviews and this certainly is a proof that it offers good value for money to its customers. This cute looking bike basket is extremely eye-catching and children in particular will love it a lot. In fact they could like to spend biking quite a bit because of the attractive and inviting look of this bike basket. Hence it would be not a bad idea to have a closer look as to what it has to offer to its customers. It is stunning in looks and is made from high quality willow bushel. It comes in pleasant colors including off-white pink, white, black and blue. All the colors are attractive and enticing in their own way. The design also is unique and resembles the classic bushel baskets which our grandmothers used to make. It also comes with a 2-strap handlebar mounting, buckles included. It has a capability of holding 11 lbs of weight. It has a total dimension of 13 inch x 8 inch x 9 inches. Customers who have used this basket have been singing praise about it quality. It well and truly is a good combination of looks and quality which is not found very often. The small size is extremely suitable for children and also for buying those small little things when your child is on an errand. It is made from eco friendly material and does not require too much of maintenance. The only drawback is perhaps the size because it can hold only 11 lbs. However, this should be enough for any bike that is used by children. In fine, this stuff has all the attributes in it to make it one of the finest bike basket solutions. It is reasonably priced and offers the best value for money. If you wish to buy a number of bike baskets in one go, then you could settle for this set of 3 Java bike baskets coming from the house of Whitmor. Apart from being used in bicycles, it could also be used in the home for different purposes. It also would be pertinent to mention that is offers one of the most natural and versatile storage options. It is suitable for office and homes. It is a great buy for keeping linens, bath, clothing, beauty products, school supplies, toys and magazines. It is simple but stylish and has a wonderful ethnic look to it. It can easily mingle with any types of bikes and could also be easily become a decorative piece for homes and offices. The built in chrome handles is suitable for easy transport and it can be affixed on to bikes without too much of an effort. It looks stunning and has the best or ergonomics combining looks and performance. It is an all purpose basket which can be used for various other purposes too. It has a wonderful Rattan look and at the same time has the toughness and durability of resin. It comes in three different sizes, small, medium and large. The measurements are 8.3×11.4×5.5 inches (small), 9.8 x 13 x 6 inches (medium) and 11.4 x 14.6 x 6.5 inches (large). All measurements are L x W x H.
The only downside is that it needs special hooks, screws, nuts and bolts for affixing it on bikes. There are very few collapsible bike baskets in the market which offer three assorted sizes as one package. Hence apart from being useful for bikers it also is a perfect buy for keeping things in homes and offices as mentioned earlier. 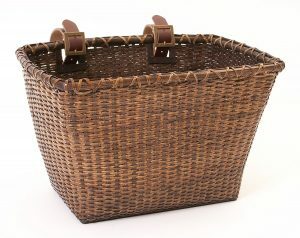 So it certainly is a multipurpose basket which is one of the reasons for its growing popularity. 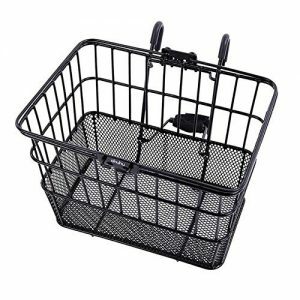 There are different types of bike baskets and therefore one must have some knowledge about the same so that you are able to make the right buying decision. To start with you must have a reasonably good idea about the different types of bike baskets that are available in the market. The list could be quite long but we will try and remain focused only on a few which are most commonly used. Wicker baskets are perhaps the most common as far as bicycles are concerned. They are woven using a variety of materials such as reed, willow, bamboo or rattan. They are known for being extremely good to look at and are eco-friendly and environment friendly. They are easy to make and they us materials that are derived from plants and trees. They require very little maintenance and if they are cared for properly they could last for many years. These are heavier and tougher when compared to wicker baskets, but they are now being commonly used by many cyclists because of some obvious benefits associated with it. They are useful for transporting and lugging relatively large amount of things and many small business entrepreneurs use them to move things which are required for their daily business. They are extremely versatile and they can be shaped to suit specific tastes and likes. They are generally silver in color though other colored baskets are also available. It is basically made from heavy metal. If you are one of those on the lookout for fashionable and colorful baskets for your bicycle, then you must look at fabric baskets. As the name suggests, they are made from different types of fabrics such as jute, cotton and mixed fabrics. They can be tough and at the same time bring in a new look at few to the bike. Finally plastic baskets are known for their stylish and modern look and they are light, durable and they can also be water proof and weather proof. They are useful for storing and transporting small quantities of household and other products safety and efficiently. They are also very cost effective and require little maintenance. Now that we have a reasonably good understanding about the different types of best bicycle baskets, it would be not a bad idea to pick and choose the right baskets. With some many options, brands and makes available, it certainly is not an easy task. So here are a few important points to be kept in mind when it comes to choosing the finest bike basket. It certainly calls for some research and getting enough information and then making the right choice. Here are a few important tips which could help you to choose the right basket for your bicycle. As mentioned above, you could make these baskets using metals, plastics, wickers, and even fabrics. However, at the end of the day, whichever material you choose, you must be able to get some good value for money out of it. The end use for which the baskets are being used should be the determining factor. For example, if you are looking for something aesthetic and good looking then going in for colorful fabric baskets could be a good choice. The next important point to be considered is ease of installation and mounting. There is no point having a big and strong basket if you are not able to mount and fix it properly. While mounting it you must make sure that the process of installation and removal can be done easily. Further you must be sure that it does not impede or disturb riding of the bike in any manner whatsoever. Finally you must be reasonably sure that the mounting position is correct. You must be able to use the basket easily. If there is a lid you must be able to open and close it easily. If required you also must be able to provide a locking system for the basket so that it offers some bit of safety as far as the things inside the basket are concerned. It is common to come across thousands of bikes having baskets attached to it. This is because there are obviously some proven advantages and benefits associated with bike baskets. The list is quite big but we will try and identify a few of the most obvious benefits as far as these baskets are concerned. As we have become civilized and technologically advanced we have forgotten the good old things which have been a part of our culture and ethos. If we look at bicycles it is quite common that almost each one of them will have a carrier or a basket. The main reason why baskets are becoming an integral part of each bicycle is because they are extremely eco-friendly, light and easy to carry. At the same time they also help a lot in moving around small things like groceries, vegetables and cosmetics that are required on a daily basis. Therefore they certainly add a lot of value and utility on a daily basis. Another reason why it makes sense to go in for bike baskets is because they are easy to install and mount. Anyone having the basic minimum tools like screwdrivers, pliers and the right sized spanners will be able to do it. They can choose the right size, shape and type of basket keeping in mind specific needs and requirements. It is also possible to change the folding bike baskets and install a new one should you so decide. This can be done quite easily and should not take more than a few minutes. This is good one for the folding bikes .Hence versatility of use, easy of mounting and installation and minimal maintenance are some of the most common reasons why it makes sense to go in for bike baskets. They are cost effective and by spending a few dollars it is possible to come out with the best of baskets. When we look at the various facts and benefits associated with best bike baskets it goes without saying that they are one of the best utility fixtures and fittings to have in a bike. They have a lot of utility value which makes them one of the best things to have in a bike. They are easy to use and environment friendly.